How has cooperation in the Arctic survived Western-Russian Geopolitical Tension? With two strokes of a pen followed by rapturous applause from the Kremlin audience, Russia formally annexed Crimea on 18 March 2014. At the time, the annexation marked the nadir of Russian-Western post-Cold War relations as Russia mobilised its military assets to annex the peninsula from Ukraine, distorting international law and conventions that had been in place since 1945. Two and a half years on from Crimea’s annexation, and it is fair to say that rather than marking the nadir of Western-Russian relations, this day was another point of continuing decline, which has been exacerbated further by disagreements following Russian intervention in Syria. Now, as Russian pilots continue with their sorties in Aleppo and the humanitarian consequences of these raids become increasingly apparent, the prospect of a Cold War-style generational confrontation between Russia and the West across issue areas of international relations is once again very real. Amidst the sanctions, condemnations and demonstrations of military might, which now characterise contemporary Russian-Western relations, it is unsurprising that for many, the Arctic is seen as a frontier. The Arctic, home to valued resources and delineated territorial boundaries, appears within the global context ripe for security competition between Russia and other Arctic states. Yet, contrary to such expectations, the Arctic has to this point remained largely insulated from wider geopolitical issues following 2014, and in some cases, cooperation has deepened. This paper will examine why this has been the case, looking firstly at the mechanisms and bodies that promote continuing cooperation, before then examining why states see cooperation as vital to their national interest. Given the frequency with which the United States and Russia accuse one another of breaking or subverting international law, it seems a fragile base on which to pin hopes of continuing Arctic cooperation. Yet, in the Arctic, relevant international law has remained both accepted and adhered to, despite wider geopolitical disagreements. This has been essential in maintaining stability within the region. Arctic states regularly express support for international law as a guiding principle within the Arctic. Each of the Arctic littoral nations under United Nations Conventions On The Law Of The Sea (UNCLOS) has an Exclusive Economic Zone (EEZ) which spans 200 nautical miles, and it is within these areas that each state is given sovereignty and is legally permitted to exploit resources (Cole 2015). In order to increase the size of its territory legally, a state must submit a claim to the UNCLOS under article 76, paragraph 8, of the United Nations Convention on the Law of the Sea, which allows states to extend their territory by up to 150 nautical miles (Cole 2015). This has become accepted practice in the Arctic for states that are looking to extend their maritime boundaries, with Russia, Norway and Denmark all submitting claims under this process and Canada likely to follow suit. The process in the Arctic has precedent, shown by Norway’s request in 2009 and the acceptance of all to its changing boundaries in the Bering Sea. Russia is an active supporter of UNCLOS, having signed up to the law in 1997, and it sees the continued compliance of all Arctic states to the laws as part of its national interest. In 2001, Russia submitted a claim based on the Lomonsov and Mendeleev ridges, suggesting that they were a continuation of the Siberian shelf and thus were part of sovereign Russian territory. While the 2001 application was not successful, it highlighted Russia’s willingness to use the United Nations route to expand its territory using established law. In 2008, while meeting at the signing of the Ilulissat Declaration, Russian and the other Arctic littoral states of Denmark, Canada, Norway and the USA reaffirmed their commitment to UNCLOS in the Arctic (ISS 2015). The most notable submission of a claim to extend territorial boundaries came from Russia in February 2016. This is important, as despite sabre-rattling elsewhere, Russia in the Arctic is currently still committed to the regional established procedures of cooperation. This may not get the media coverage that a Russian flag being planted under the North Pole received in 2007, but is a clear statement of Russian intentions towards the Arctic and their current commitment to international law in the region. What is certain going forward is that the territorial claims of states are certain to overlap, which could be a catalyst for conflict. In this situation, the agreed-upon practice is to allow the states to negotiate the final agreement of territories themselves. It is important to note that this has been done successfully previously, when Russia secured a political compromise with an Arctic neighbor, coming to a mutually satisfactory agreement with Norway in 2011 over disputed territory in the Barents sea (ISS 2016). More recently, Russian officials have spoken optimistically regarding opening bilateral discussion with Denmark over disputed territorial areas. The ability for Russia and the other Arctic states to correspond with one another on regional issues has been essential in insulating Arctic relations from wider geopolitical disputes. The Arctic has established regimes which have continued to act as a forum for regional discussion. The primary body that facilitates interaction between states is the Arctic Council which has 8 permanent members and now features 12 observer states with a voice in Arctic decision making. The Arctic Council has, since Crimea, felt the influence of geopolitics, with 7 member states currently having sanctions on Russia. However, the body has continued to fulfill its role as a forum through which states can discuss Arctic issues. Now in it’s 20th year, the Arctic Council has a strong track record of establishing and facilitating cooperation between Arctic states, with 2 binding inter-governmental agreements having been signed by the Council over oil spills and search and rescue efforts. A reason that Arctic Council efforts continue to succeed following Crimea is that the Council does not discuss hard security issues by design. The 6 Working Groups that make up the Arctic Council cover issues relevant to the Arctic and the prosperity of all Arctic nations such as marine and biodiversity protection to the challenges of advancing UN Sustainable Development Goals. The United States assumed the Chair of the Arctic Council in 2015, and the ethos of their chairmanship was ‘One Arctic’ , promoting shared responsibilities and acknowledging shared challenges in the region. During the US chairmanship, progress has been made on combatting black carbon, and the Arctic Council has been influential in improving maritime cooperation with the formation of the Arctic Coast Guard Forum. All states see the Arctic Council as an important forum for cooperation, referencing to this at the ministerial summit in Iqaluit in 2015 in which all states declared the importance of the Council in maintaining peace, stability and constructive cooperation in the Arctic. Regional collaboration between the Arctic states is essential for each of them in pursuing their regional goals and ensuring the prosperity of their Arctic populations. Addressing regional needs is thus a major reason why cooperation has managed to continue following Crimea and has in some cases deepened in the last 2 years. While military cooperation has ended following Crimea, low-level security cooperation remains vital to the regional interests of Arctic states. Coast Guard cooperation, for example, has remained untouched by developments outside the Arctic. The Arctic Search and Rescue Agreement was signed in 2011 and remains an essential part of the Arctic states’ actions in the region. The agreement divided the Arctic, establishing SAR responsibilities to each of the states. As access to the Arctic waters increases, the importance of coordinating search and rescue programs between states increases. For all states, maintaining this cooperation is essential, and it has survived the ongoing crisis in Ukraine and Syria. At the height of the Ukrainian crisis when a South Korean fishing vessel sank, Russia requested US assistance in rescue operations. For Russia in particular as the largest Arctic nation, cooperating on this issue is an essential part of its national interest in the region. Collaboration on coast guard issues has deepened further with the establishment of the Arctic Coast Guard Forum in 2015. The Forum is an important means to ensure collaboration of efforts as opposed to duplication and ensuring that regional expertise and experiences are shared for collective gain. The increasing availability of resources in the region has long been cited as a vehicle for competition and clashes as opposed to one that facilitates cooperation. However, Arctic states have mobilised to create emergency agreements for cooperation on marine oil pollution, focusing on increasing preparedness and planning joint responses. This is unsurprising, as the regional effects of a major oil spill would not only be severe within the state in which they occurred, but they would have wider ranging impacts across territories. Arctic cleanup operations would be extremely difficult due to remoteness, lack of daylight and freezing temperatures, and joint planning has occurred between Russia and other states to deal with this potential issue. An example of this collaboration is the joint exercises between states; for example, those between Russia and Norway in the Varanger Fjord area in the Barents 2015 joint exercise. Countering climate change remains the predominant challenge for Arctic states, and the impact of climate change is already evident within the region. Rapid Arctic ice melt, changing Arctic ecosystems and challenges to regional populations afflict each of the Arctic states, and collaboration on climate issues is essential for all. Combatting climate change and its impacts in the region was a major focus of the US chairmanship of the Arctic Council, and through this time 2015-2017, steps have been taken to improve regional collaboration and effort to combat climate change. Closer ties have been developed recently through the White House Ministerial 2016 which was the first of its kind. This meeting looked to establish closer links across fields in the Arctic to counter the regional impacts of climate change with particular focus on collaboration on data sharing and to address climate challenges. Global economic trends have diminished the attractiveness of developing Arctic oil in the short term. If there is to be contestation over resources within the region, this has been postponed for the time being as cooperation in the region continues. At time of writing, oil prices are at roughly $51 per barrel. With the low oil price, OPEC states refusing to cut production and developments like US shale gas, global oil markets have been in flux for some time. Currently, the race for Arctic resources narrative is not playing out as some expected. For example, while the frequently-cited statistic is that 22% of the world’s undiscovered resources reside under the Arctic ice, much of these resources actually fall within the EEZ of states, thus giving them sovereignty over these areas. The disputed areas and resources believed to be in these regions are largely deep-sea and extracting these resources would not only be effort-intensive, but if the market were to stay the same, may not be economically viable. If Russia, in the short to medium term, were looking to develop resources in the Arctic, it would need western technologies upon which it is dependent. Russian regional exploration has been affected by the sanctions that were placed on it following its annexation of Crimea. This currently, in the short term, is unlikely because of Ukraine, but in the long run, if Russia hopes to develop Arctic resources with western technology, this would limit its ability to be militarily provocative in the Arctic as this would rule out cooperation. Whether these developments will prevent competition and promote cooperation remains to be seen, but it seems that, at least for the next few years, clashes over who owns resources in the region could be delayed. There remains debate regarding Russian military presence and upgrades in the Arctic, and how much of a threat they present the other states. Russia has a considerable military presence within its territories in the Arctic and has taken great strides to improve its military hardware in the region. In April 2014, President Putin announced that a new Arctic command structure would be established to coordinate every military units operating in the theatre. The new command was designed to include four new Arctic brigades, 50 airfields by 2020, increased long-range air patrols by Russian bombers and a total of 40 conventional and nuclear icebreakers, with 11 more to be constructed. While tracking Russian military activity is problematic, given the state rarely acts in a transparent way following Crimea, Russian military actions in the Arctic have not undergone a wholesale aggressive turn. Baltic Sea tensions have not evolved in the way in which it was expected post-Crimea, with no dramatic increase in Russia’s naval and air patrolling of the North Atlantic and Arctic 2014-15. As Russia began to prioritise activities in Syria, the military build-up in the Arctic region slowed. Some of the military forces that were designed to be stationed in the High North as per the 2013 Arctic strategy have now been redeployed to Russia’s western front. The appointment of Dimitri Rogozin to become Head of the Russia Arctic Commission raised eyebrows for other Arctic states, given his history as a policy hawk. However, as Russian attention shifted to the Middle East, Rogozin now spends as much time in the Middle East as he does north of the Arctic Circle. Fear that Russia could utilise a similar mode of warfare in the Arctic as they did in Ukraine, as has been posited by some, misunderstands the specifics of the conflict in Donbass and the inpossibility of replicating a ‘little green men’ scenario in the Arctic. Other Arctic states have remained watchful of Russian activity in the region, and all militaries have conducted operations North of the Arctic circle. There is little from the actions of the other Arctic states to suggest that they are excessively worried about Russian military presence to the extent that cooperation would be jeopardised. 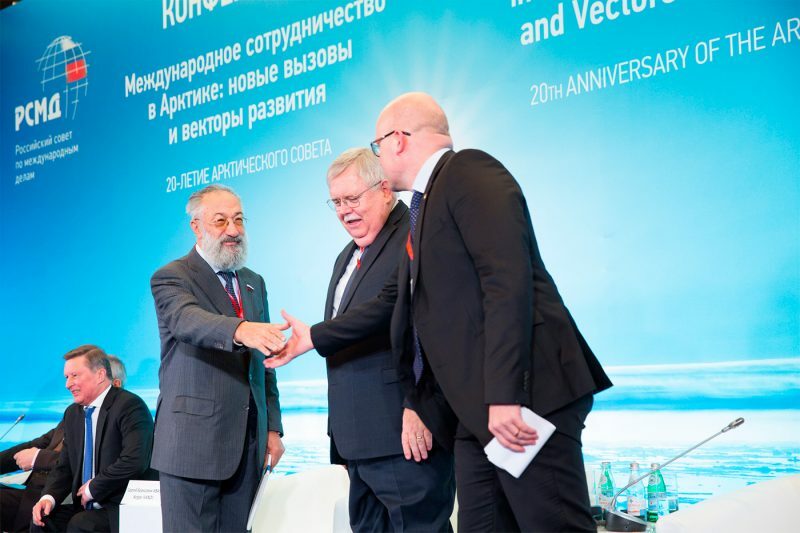 The Arctic has to this point managed to survive a deterioration in Russian-Western relations based on a combination of regional joint concerns, respect for international law in the region and continuing forums for discussion and collaboration. It is safe to say that Arctic cooperation is based on whether Russia continues to cooperate within the region, and the extent to which its actions continue to be seen as benign by other states. While Russian activity is rarely transparent as discussed, it is within their interests to ensure that cooperation on Arctic issues continues. What is positive for the future of Arctic cooperation is that Russian-Western Relations cannot feasibly deteriorate to a lower level than they currently find themselves and much cooperation has survived despite this. So long as states remain committed to cooperation, which is for their mutual benefit, and also retain commitment to the laws on territorial boundaries, there is a chance that this cooperation can continue moving forward. Baev, P. (2015). The Political Landscapes Trends and Prospects: Russian Aspirations. In:Arctic Security Matters, 1st ed. [online] ISS. Available at: http://www.iss.europa.eu/uploads/media/Report_24_Arctic_matters.pdf [Accessed 14 Jul. 2016]. Bierman, S. and Mazneva, E. (2016). [online] Global Association of Risk Professionals. Available at: http://www.garp.org/#!/risk-intelligence/detail/a1Z400000033X3SEAU [Accessed 14 Jul. 2016]. Bodner, M. (2015). Russia’s Polar Pivot. [online] Defense News. Available at: http://www.defensenews.com/story/defense/policy-budget/warfare/2015/03/11/russia-arctic-bases-soviet-northern-command-navy-fleet-siberian-island/24335619/ [Accessed 7 Jul. 2016]. BUIKEMA FJAERTOFT, D. (2011). Norwegian Grand Strategy and the Arctic : Global Brief. [online] Globalbrief.ca. Available at: http://globalbrief.ca/blog/2011/06/27/norwegian-grand-strategy-and-the-arctic/ [Accessed 7 Jul. 2016]. Coffey L and Kochis D(2016). NATO Summit 2016: Time for an Arctic Strategy. [online] Available at: http://www.heritage.org/research/reports/2016/06/nato-summit-2016-time-for-an-arctic-strategy [Accessed 7 Jul. 2016]. Cole, L. (2015). Geo Briefing: Arctic Tension – Geographical. [online] Geographical.co.uk. Available at: http://geographical.co.uk/geopolitics/geopolitics/item/904-arctic-tension [Accessed 7 Jul. 2016]. De Sitter, M. (2015). NATO & the Arctic. [online] Arcticyearbook.com. Available at: http://www.arcticyearbook.com/commentaries2015/160-nato-the-arctic [Accessed 7 Jul. 2016]. France-Presse, A. (2015). Russia Unveils New Navy Icebreaker in Arctic Military Focus. [online] Defense News. Available at: http://www.defensenews.com/story/defense/naval/2016/06/11/russia-unveils-new-navy-icebreaker-arctic-military-focus/85747556/ [Accessed 7 Jul. 2016]. Groenning, R. (2016). Why military security should be kept out of the Arctic Council – The Arctic Institute. [online] Thearcticinstitute.org. Available at: http://www.thearcticinstitute.org/why-military-security-should-be-kept-out-of-the-arctic-council/ [Accessed 7 Jul. 2016]. The Guardian, (2014). Russia signs 30-year deal worth $400bn to deliver gas to China. [online] Available at: https://www.theguardian.com/world/2014/may/21/russia-30-year-400bn-gas-deal-china [Accessed 7 Jul. 2016]. ISS, (2015). Arctic Security Matters. [online] ISS. Available at: http://www.iss.europa.eu/uploads/media/Report_24_Arctic_matters.pdf [Accessed 7 Jul. 2016]. O’Dwyer, G. (2016). Sweden, Finland Stress Defense Cooperation Ahead of Russian Visit. [online] Defense News. Available at: http://www.defensenews.com/story/defense/international/europe/2016/06/24/finland-sweden-nato-russia/86334800/ [Accessed 7 Jul. 2016]. O’Dwyer, G. (2015). Tensions High as Russia Responds to Exercise. [online] Defense News. Available at: http://www.defensenews.com/story/defense/international/europe/2015/05/31/russia-nato-nordic-tensions-exercise/28076027/ [Accessed 7 Jul. 2016]. Osthagen, A. (2016). High North News – Op-Ed: Coast Guard Cooperation with Russia in the Arctic. [online] Highnorthnews.com. Available at: http://www.highnorthnews.com/op-ed-coast-guard-cooperation-with-russia-in-the-arctic/ [Accessed 7 Jul. 2016]. Pavel K. Baev, P. and Boersma, T. (2016). With Russia overextended elsewhere, Arctic cooperation gets a new chance. [online] The Brookings Institution. Available at: http://www.brookings.edu/blogs/order-from-chaos/posts/2016/02/18-us-russia-arctic-cooperation-baev-boersma [Accessed 7 Jul. 2016]. Petterson, T. (2016). UN to consider Russia’s Arctic continental shelf claim this summer. [online] Eye on the Arctic. Available at: http://www.rcinet.ca/eye-on-the-arctic/2016/04/28/un-to-consider-russias-arctic-continental-shelf-claim-this-summer/ [Accessed 7 Jul. 2016]. Presse, A. (2015). Arctic Attracting New Military Scrutiny. [online] Defense News. Available at: http://www.defensenews.com/story/defense/2015/11/01/arctic-attracting-new-military-scrutiny/75001476/ [Accessed 14 Jul. 2016]. Sergunin, A. and Konyshev, V. (n.d.). Russian Military Activities in the Arctic: Myths & Realities. The Arctic Yearbook. [online] Available at: http://www.arcticyearbook.com/images/Articles_2015/commentaries/COMM_A_Sergunin%20and%20Kolyachev.pdf [Accessed 7 Jul. 2016]. SIPRI, (2016). Still Quiet in the High North?. RUSSIA’S ARCTIC SECURITY POLICY. [online] SIPRI. Available at: http://books.sipri.org/files/PP/SIPRIPP45.pdf [Accessed 7 Jul. 2016]. The United Nations, (2016). United Nations Convention on the Law of the Sea. [online] Available at: http://www.un.org/depts/los/convention_agreements/texts/unclos/unclos_e.pdf [Accessed 7 Jul. 2016]. Trainor, C. (2014). Why Russia’s Arctic strategy is starting to worry NATO. [online] Russia Direct. Available at: http://www.russia-direct.org/why-russias-arctic-strategy-starting-worry-nato [Accessed 7 Jul. 2016].